Let me be upfront — I’m only a guest here in Tasmania. I’m a fire scientist of 20-plus years from the United States, and currently associate professor at the University of Idaho. I started out my career as a wildland firefighter for the US Forest Service, the federal agency that does most of the firefighting in the US, and I am currently a Visiting Scholar at the University of Tasmania researching global fire disasters. What I see happening here, though, is incredibly similar to what we have been experiencing in the western US for the last couple of decades. More intense and larger wildfires becoming more destructive during drier and hotter summers due to climate change. Prolonged smoke events causing widespread health impacts. Homes, businesses, and lives threatened by embers and flames. 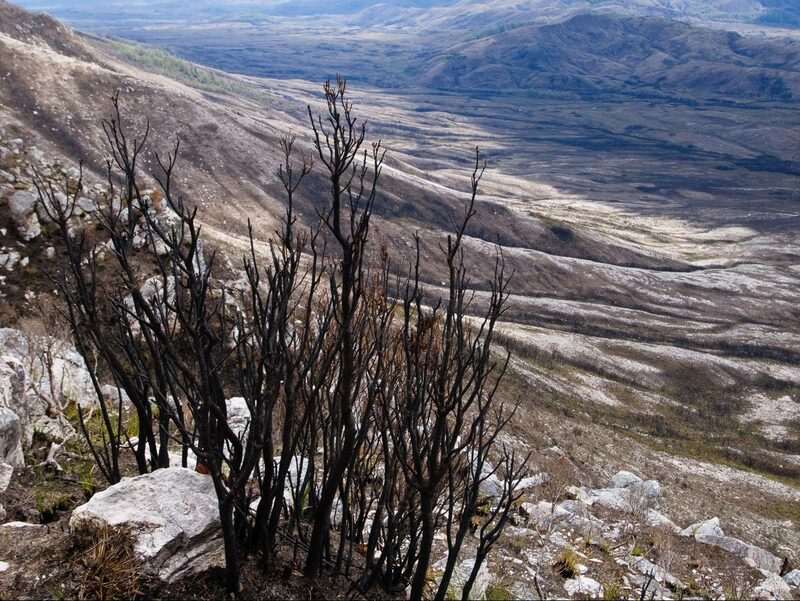 Critical wilderness areas threatened, including World Heritage areas inside national parks. And calls from the public for increased fire suppression and timber management to end the crisis. I don’t know what will or won’t work here in Tasmania. But I do know what we have tried in the US, and what has failed. We’ve tried suppressing all fires (it didn’t work). We’ve tried increasing our firefighting personnel, building crews of specialised forces like hot-shots and smoke-jumpers. We’ve tried using modern technology to reduce ignitions and stop the fires before they start. We’ve converted some of the largest aeroplanes in the world to bombers that drop long lines of fire retardant. We’ve tried logging our way out of the problem. Most of these efforts have had only limited effectiveness, costing us billions of dollars, and in some cases firefighter lives. Here’s what we know does work in the US: preparing ahead of time and focusing on safety. We changed our building codes in California, and newer homes built to code are surviving fires. We have developed emergency evacuation plans and clear roads of brush so people can get out. We have cleared vegetation around homes and communities to create green fire breaks and ‘defensible space’. We used prescribed fires to reduce fuels under controlled conditions. We let wildfires burn in the wilderness but use aggressive point protection strategies to save important cultural sites and endangered species. We primarily use aircraft where we can put firefighters on the ground to reinforce fire retardant lines, and often only around communities. In short, we are slowly and painfully learning to live with fire. We are still learning what works and what doesn’t in the US; obviously we haven’t solved the wildfire problem. But here’s what we know with certainty: we will have larger, longer-burning, and more intense wildfires under climate change. We will see novel fire behaviour in places we’ve never had wildfire before — our temperate rainforests are starting to burn, too, and last summer we had a true fire tornado. Suppression costs have already spiralled out of control — the US spent over $3 billion in 2018 fighting fires. We will have to make hard decisions about priorities — what can we protect and what do we sacrifice in order to protect human lives and property? This past November, 86 people died during a single wildfire in California. One of the goals of my research is to understand how we can prevent such horrors from happening again. Are things really so different here in Australia? Next week is the 10th anniversary of the Black Saturday bushfires in Victoria that killed 179, and the 52nd anniversary of the Black Tuesday fires that killed 62 right here in Tasmania. Records are falling for temperature and lack of rainfall as Australia experiences a blistering summer. As we move forward, preparation for (rather than reaction to) wildfires will be paramount to saving lives, saving money, and saving the places we care about most, both locally and globally. This Op-Ed first appeared in The Mercury 2 February 2019. This is absolutely spot on ty so much for posting this. Absolutely agree, positive, forward thinking solutions for those of us living in bushfire risk areas. Uninformed pollies need to be replaced with the experts! I live at Dolphin Sands on the East coast of Tasmania. Our designated safe place posted by the T.F.S is Swansea to our west. Both available roads run east to west, one sealed and the other sand and mostly impassable. Historically fires travel west to east, the power lines are down and the escape route blocked by fire trucks and earth moving equipment not to mention large quantities of dry grass and dead shrubbery both sides of the road. We are advised by the TFS not to go to the beach due to danger of drowning and of vegetation in the sand dunes. If you can work out the logic here, remembering we have chosen to live in one of the highest fire prone areas in the State, you might understand why I will risk drowning rather than frying in my car! Great article. We need more intelligent analysis and less politics around managing fires in Australia. After fighting bushfires for 35 years I have come to the conclusion that we must fight the fires before they start. Clear the fuels so that you can survive the heat and embers. Prioritize and train for the worst case, because the climate is directing us toward the worst case. Learn to safely live with fire. We need to listen to the experts, and start demanding better funding for risk mitigation and resilience projects. There is some great work being done out there, for instance the Bushfire Building Council of Australia bbca.orga.au – CSIRO – Bushfire Building Conference in the Blue Mountains through the BMEE. The pollies need to talk to these people, attend these conferences, listen and take real action. Less submarines, more resilience!